Those who know Jahangirnagar University, always admire its cultural scene. Over the last few decades, the campus has been turned into a vibrant place for the country's culture and the credit goes to creative and hardworking activists of the cultural organisations, thousands of passionate audiences and the amazing Mukta Mancha, the amphitheatre. In such a beautiful campus, some ugly incidents have recently sent shockwaves through the nation that’s already disgusted with political chaos, load shedding, traffic jam, extra-judicial killings and shutdowns. On April 28, a group of Chhatra League activists beat up at least 15 cultural activists. Teachers and journalists were not spared. The proctor, the person entrusted with ensuring security of students, was standing nearby. The victims' cries for help failed to move him. Chhatra League over the past three years hogged the headlines several times, but not for any good reason. But the case of its JU unit is a bit different and difficult to understand. The faction that dominates the campus is widely known as VC League. On January 8, some VC League members beat up Zubair, a student of the English department of the university and a rival faction member. Profusely bleeding, he died the next day. For the Jahangirnagar community, Zubair's killing was not easy to accept. A platform of teachers, Shikkhak Samaj, started agitating against the administration, the Vice-Chancellor Shariff Enamul Kabir to be precise. They demanded that among many issues, an investigation into the role of the administration before and during Zubair’s murder and an end to teacher recruitment irregularities. Students under the banner Santraser Biruddhe Jahangirnagar also forged a massive movement. Prof Shariff could not care less. The teachers called strike and laid siege to the VC office, demanding his removal. On April 25, the VC, widely criticised for violating the rules of this public university, allowed the police to arrest two teachers from the campus on charges of beating another teacher. Angered, the Shikkhak Samaj announced sit-ins in front of Shariff's residence. They vowed to continue the agitation until the vice-chancellor steps down. The day before the cultural activists were attacked, Chhatra League cadres vandalised the stage set up for the teachers' protest programme. They also burned the banner. The media paid attention. Journalists gathered at the two gates of the VC’s residence. One gate was swarmed with anti-VC teachers and the other by their rivals. On April 27, the JU Syndicate announced summer vacation from May 5 and banned demonstrations near the VC residence and office. Opposing all these decisions, Jahangirnagar Sangskritik Jote, a forum of cultural organisations, took to the street. On April 28 around noon, the Jote brought out a procession. In the afternoon, while the Shikkhak Samaj was addressing a press conference, some Chhatra League men were clubbing Mahmud Koli, president of the Jote, with rods and iron pipes. Nearby, some others were beating theatre activist Sudeep. Those who went to save the two were also attacked. The same day, Prime Minister Sheikh Hasina was receiving a crest from Prof Zillur Rahman Siddique, a former VC of JU, for her “maritime row victory” against Myanmar. Around 9:00pm, Chhatra League again swooped on agitating students and teachers. Right before the attack, nobody knows if this is a coincidence, darkness descended over JU; power was shut dawn. Police were withdrawn. The next day hundreds of students joined a procession led by the Jote; around 11:00am at TSC, which marched through the campus to end at the VC’s residence. They demanded the removal of Prof Shariff and justice for the attack on cultural activists. Shariff Enamul Kabir should have seen this coming. Shariff, a Gopalganj League candidate, got his appointment as vice-chancellor on February 24, 2009. His actions capped all the major graft scams of JU. He also came down hard on cultural organisations. It was his cadres who torched the rehearsal room of cultural organisation Dhwani. Documented the all history of last the 15 years, were burned to ashes. And during a theatre fest, Chhatra League attacked Mukta Mancha when the audience was enjoying a show presented by a troupe from Dhaka. Armed cadres ran riots and smashed drama sets. Sharif also started felling trees. He chopped down all the beautiful trees from Dairy Gate to the arts faculty, saying the trees obstructed the view of the Shaheed Minar from Dhaka-Arica highway. This is the first time in the history of Jahangirnagar University that very few migratory birds came to the campus. Cleaning of lakes, fish farming and use of pesticide are to be blamed. He has set a new record. Only a little over three years ago, he appointed around 200 teachers. Some teachers did not even take a written test; viva was enough for them. Many were average students. They were guarding the west gate of VC residence on April 27. Some of these teachers were assigned as hall provosts. Their main duty was to take care of VC League members. Jahangirnagar has a history of resistance against rapists, fascists and fanatics and a history of cultural activism. Students and teachers started a fast. Former students, intellectuals, artists, singers, bloggers expressed solidarity. The movement got extensive coverage in the mainstream media, Facebook and blogs. The national politics was not quiet either. The government was grappling with the railwaygate scandal, the disappearance of Ilias and the resignation of Sohel Taj. Finally, Prime Minister Sheikh Hasina stepped into the JU crisis. 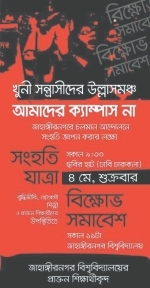 On May 3, the Shikkhak Samaj postponed their demonstration on assurance from Hasina that she would look into the matter. She talked separately to both factions of JU teachers. Two days later, agitating students at Jahangirnagar University called off their hunger strike. Already many of them have been hospitalised. A protester writes on her Facebook status: “Struggle continues…my campus is not for killers, criminals and thugs. …we haven't left the movement. If we don't get a solution shortly, we know what to do. We know how to fight for our rights. So, the ball is in the PM's court. What will she do? Will it again be a promise not kept? Will it be like the government statement following Sagar-Runi murders, that within 48 hours the killers will be brought to justice? We hope not. Let's hope for the best.